97% natural hair therapy. 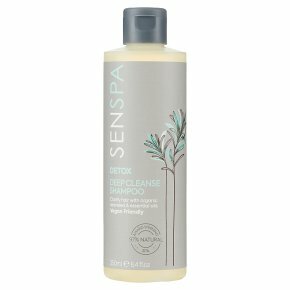 With organic seaweed & essential oils of sweet orange, lemon & rosemary.Senspa Deep Cleanse shampoo combines organic seaweed with a blend of bladderwrack, rockweed and Dead Sea salt, to deeply yet gently cleanse your hair and help reduce breakage. A micronised wheat-based protein, proven to effectively repair, strengthen and protect hair from within, helps to leave hair smoother and strengthened from root to end. The harmonious blend of essential oils of sweet orange, lemon and rosemary help to leave hair beautiful fragranced. Directions: Gently massage shampoo onto wet hair into a rich lather. Rinse thoroughly. Repeat if necessary. For best results follow with Senspa Replenishing conditioner. Warning: For external use only. Avoid contact with eyes. Should this occur rinse immediately with warm water.<br><br>Due to the high concentration of natural oils and botanicals, product may vary over time and from batch to batch, this does not affect the quality or safety of the product. Avoid contact with clothing as may cause staining.